Roche markets the disetronic spirit insulin pump as the ACCU-CHEK pump. The ACCU-CHEK pump system includes the following: an insulin pump, a Palm PDA and ACCU-CHEK Pocket compass software, for doing bolus calculations. The owner of the pump system can secure optional components, such as the ACCU-CHEK blood glucose monitoring system, the ACCU-CHEK insulin pump carrying case and ACCU-CHEK training. The training can be obtained through online instruction, the purchase of a workbook or face-to-face instruction. Like the optional training, the optional pump carrying case gives the pump wearer yet another opportunity to select from a menu of possibilities. The ACCU-CHEK carrying case can be a plastic clip case, a leather case, a neoprene case or a soft case (designed to carry the pump in a bra or pant leg). Those who might be considering the purchase of a disetronic spirit insulin pump should know something about the long history behind that pump. The first disetronic insulin pumps came out of a small factory in Bergdorf, Switzerland. A company with only 3 employees produced that first pump in 1984. In 1991, the first disetronic insulin pump went on sale in the United States. 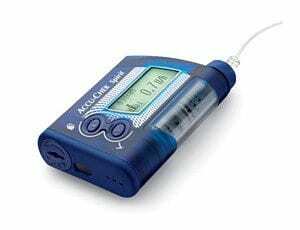 In May of 2003, the company that put out the disetronic insulin pump became part of the Roche Diabetes Care Unit. That change brought together the makers of an excellent pump and experts in delivery of top-rated care for diabetes patients. The features on the disetronic spirit insulin pump reflect Roche’s commitment to delivery of good care for diabetics. The pump’s three different operating menus help to highlight the important features available on the disetronic spirit insulin pumps. Those menus give the pump wearer the ability to use a program that matches with the requirements and the experience of the diabetic who has chosen to wear the pump. A diabetes patient who is wearing an insulin pump for the first time should feel comfortable using the operating program with the STANDARD menu. A diabetic who has had more experience with the various buttons and displayed figures on the insulin pump could “graduate” to an ADVANCED menu. A diabetic who has a special requirement might choose to use the program with the CUSTOM menu. The makers of the disetronic spirit insulin pump realize that the pancreas adds more insulin to the blood stream every 3 minutes. The disetronic pump delivers insulin at the same basal rate. Still, the body can undergo a sudden need for more insulin. For that reason, the disetronic pump contains five basal rate profiles. By working with those five different basal rate profiles, the wearer of the disetronic insulin pump can call-up 24 variations on the hourly basal rate. The pump wearer can also vary the amount of insulin in the bolus dose. The pump wearer can select from four choices: quick, standard, extended or multi-wave (a dose delivered in two steps). The makers of the disetronic spirit insulin pump have programmed the pump to perform multiple safety checks every day. When a safety check notes some error in the performance of the pump, it can alert the wearer to that error. The pump has the ability to send clear and explicit error messages. The disetronic spirit insulin pump comes with an integrated key lock. The diabetes patient can thus feel confident that no unauthorized person will somehow alter the programmed functions on the pump. Finally, the disetronic spirit pump has tactile buttons. Because the pump has those tactile buttons, a pump wearer can make changes in the settings on the pump by hitting a piece of clothing that is hiding the same pump. The diabetes patient does not need to remove the pump from its holder in order to reprogram the pump.